I was doing an interview with Neil Kearney to promote the new book when he asked me “What is the worst thing a horse can do at the racetrack?” My answer was “Weaving!” It has a behavioural handicap of around 50%, which means that a horse’s chance of winning are effectively halved! I didn’t have to look far for an example. Here’s Distant Dreams in its stall rocking and nibbling rhythmically before the last race. The horse finished second last. Unfortunately not a lay at 100/1! I am turning into a surly curmudgeon, otherwise known as a grumpy-bum. A nine race program is hard enough, but a 30-minute gap between races is intolerable, and now they’ve blocked off my path from the birdcage stalls to the mounting yard with a party area for young members. And what’s more they are blasting out head-banging doof-doof music to add to my pain. Not to mention the tingling it gives my tinnitus. And even more what’s more there is a 100 metre detour to get to the yard via the main members entrance. Nine races times 200 metres is an extra 1.8 kms a day that I have to walk! I think I need a good lie down and rest to compose myself! At least I nailed the two-year-olds. Weatherly looked a standout and won like a good horse. 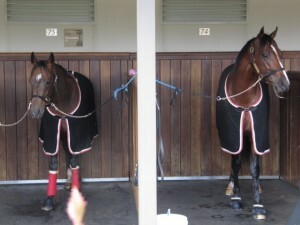 In the original Watching Racehorses a stable pony was one of the most positive variables with a handicap of +67. In the new book Watching More Racehorses it has plummeted to -15! Many more trainers are bringing a pony to the races, so the only explanation must be that they are poorer quality horses. Of course, the big trainers don’t need to worry about a pony as they have multiple runners to act as companions. Paul Messara only had the one runner, although in the stalls it was hard to tell which one was the pony, well, not that hard. Weatherly obviously appreciated the company. 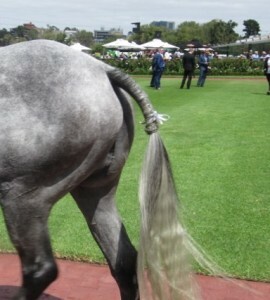 And what do you think of plaited tails? Secret Toy Bizness had a fancy one. I remain suspicious! I gave some back on Gai’s horse River Wild which missed the jump by five lengths, but got it all back and more on Mighty Like, which powered home to grab third by a whisker at $4.00 for the place. I like that horse! I spent two races sitting down composing myself and went home before the last. So I only ended up doing an extra 1.2 kms. Why am I complaining? I’m not looking forward to it. The 30-minute trial that is. Nine races are hard enough for me as it is, but 30 minutes between each race? If you wait say five minutes for correct weight and the horses have to be in the mounting yard some 20 minutes prior, that leaves just five minutes to dash around the stalls and check out say 20 or 30 horses and then have time to cast an eye over the parade ring. It’s obviously the first step towards a ten race program for armchair punters at home. Soon they will be ghost meetings! I don’t like it. Not happy Jan. I struggled again with the two-year-olds. The Chris Waller filly Gretna looked terrific in the yard and led them up to the 200 before totally compounding. Another weak filly. I got my money back on Pat Carey’s Dan Zephyr on the short back-up, but with absolutely no faults. I celebrated by ordering my free drink in the Medallion Bar. The barman couldn’t believe me when I asked for a Diet Coke, but took pity on me and searched around for the biggest glass he could find. Only three more weeks of Febfast to go!